Even though the success rate of the tax department at all three levels of appeal — Appellate Tribunals, High Courts, and the Supreme Court — is under 30 per cent for both direct and indirect tax litigation, it remains “undeterred” and “persists in pursuing litigation at every level of the judicial hierarchy”, making it the largest litigant in India, stated the Economic Survey 2017-18. “The tax department unambiguously loses 65 per cent of its cases. Over a period of time, the success rate of the department has only been declining, while that of the assessees has been increasing….The picture that emerges over a period of time is the following: even though the department’s strike rate has been falling considerably over a period of time, it is undeterred, and persists in pursuing litigation at every level of the judicial hierarchy,” the survey stated. Since tax litigation constitutes a large share of the workload of High Courts and the Supreme Court, the Survey stated that the tax department and courts may gain from a reduction in appeals pursued at higher levels of the judiciary. “Less might be more,” the Survey stated. The claims for indirect and direct tax stuck in litigation — Appellate Tribunal and upwards — by March, 2017, amounted to nearly Rs 7.58 lakh crores, which is over 4.7 percent of GDP. “For the tax department, these numbers, especially the value of amounts involved have been rising sharply over time,” the Survey stated. 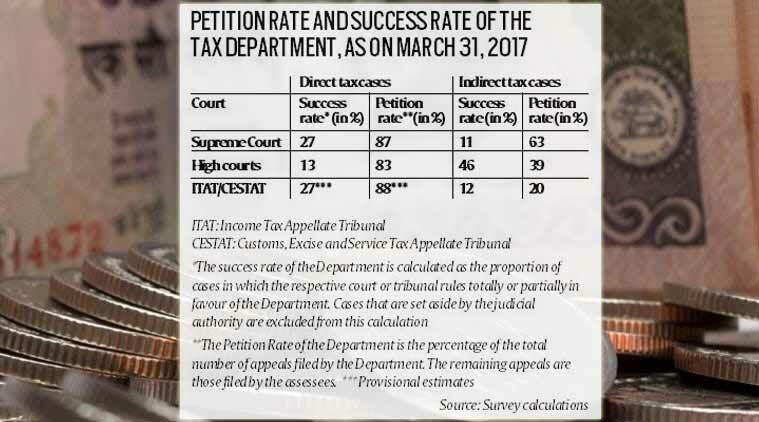 As of March 2017, there were approximately 1.37 lakh direct tax cases under consideration at the level of Income Tax Appellate Tribunal (ITAT), High Courts and Supreme Court. “Just 0.2 per cent of these cases constituted nearly 56 per cent of the total demand value”, and on the other hand, “66 per cent of pending cases, each less than Rs. 10 lakh in claim amount, added up to a mere 1.8 per cent of the total locked-up value of pending cases”, the Survey stated. The picture is similar for indirect tax litigation. As of the quarter ending March 2017, a total of 1.45 lakh appeals were pending with the Commissioner (Appeals), Customs, Excise and Service Tax Appellate Tribunal (CESTAT), High Courts and the Supreme Court together, that were valued by the Department at Rs 2.62 lakh crore. “What is interesting is that the success rate of the department at all three levels of appeal — Appellate Tribunals, High Courts, and Supreme Court — and for both direct and indirect tax litigation is under 30 per cent. In some cases it is as low as 12 per cent,” the Survey noted.